Mitjili Napurrula was born in Ikuntji (Haasts Bluff) after her mother Tjunkayi Napaltjarri, came in from the desert with her mother, a Pintupi/Luritja woman from Yumari. Dispossession and drought were only two of the factors that led to a series of migrations from the desert to mission or government settlements in the midtwentieth century. Following the outstation movement of the late 1970s and early 1980s, Aboriginal communities sprang up throughout the region, each home to a distinctive art movement. Despite being the first ration depot in the region, Ikuntji was one of the last communities from which this widespread renaissance of cultural affirmation emerged. 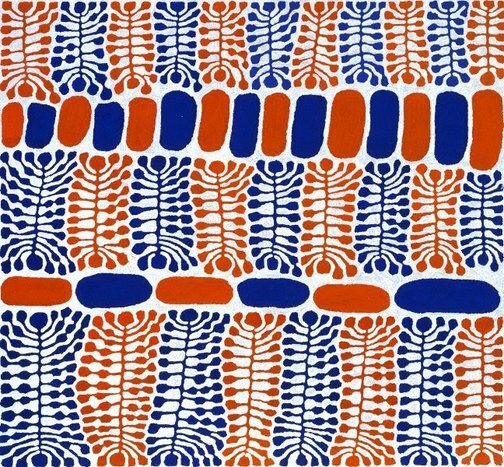 Like many of her generation, Napurrula witnessed the genesis of the Papunya Tula art movement and the artistic contribution made by members of her immediate family. 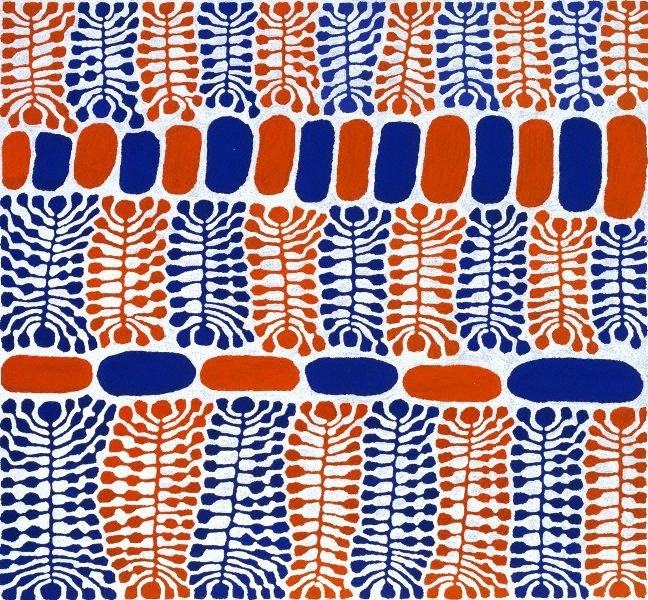 Tjunkayi Napaltjarri and her sister Wintjiya made small craft items for Papunya Tula Artists, until venturing into painting independently on 'Minyma Tjukurrpa' – the 1994 Haasts Bluff/Kintore women's painting project. Napurrula's brother, Turkey Tolson Tjupurrula, was one of the founding members of the Papunya Tula Artists cooperative. Napurrula and Tjupurrula had the same father, Tupa Tjakamarra, from whom they inherited the right to paint works related to llyingaungau in the Gibson Desert. This site, south of Walungurru (Kintore), some 520 kilometres west of Mparntwe (Alice Springs), is where the artist's Mutikatjirri ancestors assembled their kulata (spears) for a conflict with the Tjukula men. Allusive works that refer to the straightening of kulata by Tjupurrula are among the landmark paintings of the movement's 30-year history. The paintings of Napurrula and her husband, Long Tom Tjapanangka, have come to be understood as archetypical of Ikuntji art since they began to work with the arts centre in 1993. Napurrula remembers, '... After I got married, my mother taught me my father's Tjukurrpa in the sand, that's what I'm painting on the canvas'. In Napurrula's major untitled painting of 1999, coagulated white pigment eddies around abstract forms that refer to the spearwood trees. The tightly structured patterning of the key motifs and bold use of colour demonstrates the artist's confidence in her individual artistic vision within a family of superlative artists – and the cultural heritage that continues to inform the myriad expressions of Western Desert artists. Christine Nicholls, One sun one moon: Aboriginal art in Australia , ‘Painting with passion and purpose: Yuendumu, Lajamanu, Willowra, Nyirrpi and Ikuntji’, pg. 195-201, Sydney, 2007, 194 (colour illus.). Hetti Perkins, Tradition today: Indigenous art in Australia , 'Mitjili Napurrula', pg. 106, Sydney, 2004, 106, 107 (colour illus. ).